Smoking fish is so rewarding. It is a great way to preserve fresh fish, especially after an expedition that yielded more than anticipated. While salmon and trout are the most commonly smoked fish that you will find in your local market, you can smoke pretty much any fish, including shellfish. I never really considered smoking tuna because the flesh just seems so buttery and delicate. However, travelling through Europe, I discovered many ways that tuna is served and/or preserved. Cooked tuna is often pressure canned (also referred to as jarred) in olive oil and herbs to preserve it. It is also brined and smoked. In northern climates, fresh tuna is hung to dry in a cold or hot smoke house for longer preservation. We’ll explore a simple method for smoking tuna on a Masterbuilt Electric Smoker. There are many recipes that call for curing the tuna in a liquid brine the day before smoking. As you may already know, I like to explore options when it comes to liquid brines. I will occasionally use them for tougher cuts of meat. However, fish is where I am hesitant. I think a liquid brine pre-cooks the fish and breaks the flesh down too much. My preference for smoked tuna is to use a dry brine or none at all. If not using a dry brine, season the tuna steaks with a bit of sea salt before smoking. The recipe developed here uses a dry brine that can be done the day before. If you don’t have time to brine, proceed with the recipe without that step. The dry brine does pull some of the moisture out of the fish so that the flesh remains firm while smoking. Ahi tuna is a great choice for smoking. 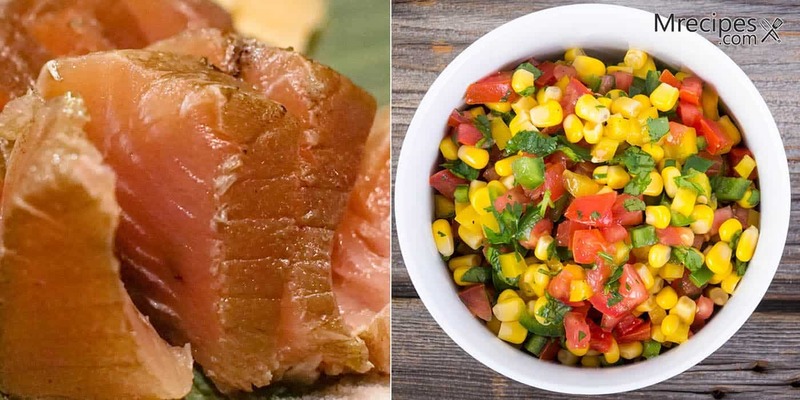 This recipe is nice with a side of smoked or grilled corn salsa and fresh avocado slices. Make the salsa before smoking the tuna. You can do this a day in advance. This recipe will serve 6 people. The smoked tuna can be stored in the refrigerator for a few days in sealed bags. 1. Coat the tuna steaks with the salt and sugar on all sides. Place these in a sealed container or baggie and refrigerate for 4 hours or overnight. 2. Add water to the pan in your smoker. Place wood chips in the tray. Preheat the smoker to 190°F. 3. Remove the tuna steaks to a clean surface and wipe off most of the dry brine. Coat both sides with EVOO, lemon pepper seasoning, and garlic powder. 4. Place the tuna steaks directly on the smoker rack and put 2 slices of lemon on top of each steak. Place the rack back in the smoker. Smoke for 1 hour. 5. At 1 hour, check the internal temperature with a digital thermometer. You are looking for 140 to 145°F. Continue to smoke until you achieve that temperature. This will take approximately from 60 to 105 minutes. 6. Remove to a cutting board to rest for just a few minutes. Serve with fresh lemon wedges, corn salsa, and slices of ripe avocado. This recipe calls for cilantro, which is classic in salsas. If you are not a fan of cilantro you can substitute with fresh flat leaf parsley. If you are short on time you can substitute a good quality canned corn that has been well drained and canned chili peppers. 1. Smoke the corn and jalapeños before smoking the tuna so they can cool down. You can make this recipe the day before. See the recipes for smoking vegetables here. 2. With a knife, carefully slice the corn kernels off of the cob. Chop the tomatoes, peppers, and scallions into small bite size pieces, not too much larger than the corn kernels. Mince the garlic and finely chop the cilantro. 3. Add all the vegetables, tomatoes, cilantro, garlic, and cumin to a large mixing bowl. Give this a toss to combine. Squeeze the lime juice over the produce, add the olive oil, and season with salt to your liking. Mix well together and allow the salsa to sit for an hour and up to 24 hours covered in the refrigerator.